Ryan Fitzpatrick threw for 417 yards and 4 TDs and ran for one more in Tampa Bay's opening-day win. 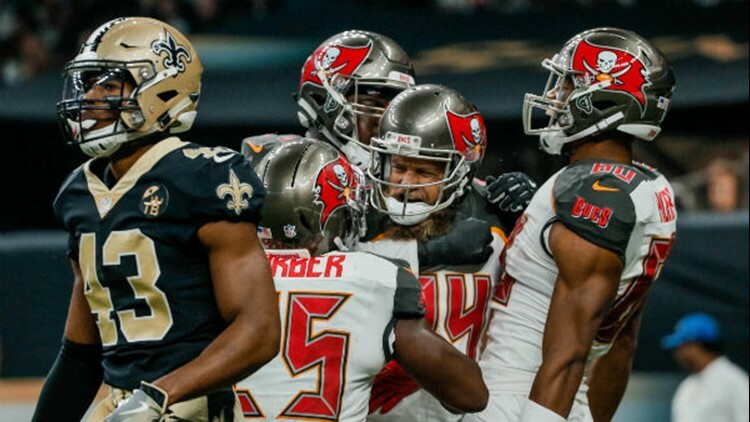 NEW ORLEANS (AP) - Ryan Fitzpatrick highlighted a 417-yard, four-touchdown performance with two scoring strikes of more than 50 yards, and the Tampa Bay Buccaneers stunned the New Orleans Saints 48-40 on Sunday. Starting for the suspended Jameis Winston, Fitzpatrick completed 21 of 28 passes without an interception and also ran for a short touchdown, bowling over free safety Marcus Williams on his way into the end zone. Saints cornerback Marshon Lattimore, the 2017 defensive rookie of the year, had arguably the worst performance of his career trying to cover receiver Mike Evans, who caught seven passes for 147 yards, including a 50-yard touchdown that put the Bucs up 41-24 late in the third quarter. After Jackson's second TD catch over the middle, Fitzpatrick backpedaled giddily for about 20 yards behind the line of scrimmage before thrusting his arm upward in celebration, seemingly oblivious of the roughing-the-passer penalty called on defensive tackle David Onyemata moments after Fitzpatrick had released the ball. The Saints, coming off a playoff appearance and hosting a team that won only five games last season, were among the more heavily favored teams in Week 1. They put together a frantic offensive flurry in the fourth quarter. Kamara scored on a 1-yard run and again on a 7-yard catch. Both were followed by 2-point conversions, cutting the Saints' deficit to eight points with 3:31 to go. On third-and-11, Fitzpatrick needed to make one more play - and did. He scrambled to his left for 12 yards at the two-minute warning. With New Orleans out of timeouts, Fitzpatrick was able to run out the clock. Drew Brees was 37 of45 for 439 yards and three TDs for the Saints. Alvin Kamara, the 2017 offensive rookie of the year, caught nine passes for 112 yards and one touchdown to go with two touchdown runs. Receiver Michael Thomas caught a franchise single-game record 16 passes for 180 yards and a TD, but turned the ball over on a fumble across midfield in the third quarter. Tampa Bay scored on six of its first seven possessions and the only drive of the first half that did not produce points was when the Bucs ran out the final 55 seconds before halftime. Tampa Bay did not punt until their eighth drive ended with Fitzpatrick overthrowing an open receiver on third down, about halfway through the third quarter. The Saints punted only once in the first half, and were only one score down after Thomas' 6-yard touchdown catch made it 31-24 shortly before halftime. With Mark Ingram serving a four-game suspension for use of a banned substance, the Saints brought in running back Mike Gillislee after he was cut by New England. In his Saints debut, Gillislee fumbled in the second quarter on a hit by Vernon Hargreaves. Cornerback Justin Evans scooped up the loose ball and ran it back for a 34-yard TD. The Saints were fortunate to give up only a field goal after Onyemata and defensive end Marcus Davenport were flagged for roughing the passer on back-to-back plays in the third quarter. Onyemata was penalized under a renewed emphasis on forbidding defensive players from driving quarterbacks into the ground with the full weight of their bodies. It was his first of two roughing penalties in then game. Davenport, the Saints' first-round draft choice, struck Fitzpatrick's helmet with his own. Buccaneers: Hargreaves was helped to the locker room with a shoulder injury in the fourth quarter. Saints: New Orleans did not announce any injuries. Buccaneers: Host Philadelphia on Sunday. Saints: Host Cleveland on Sunday.